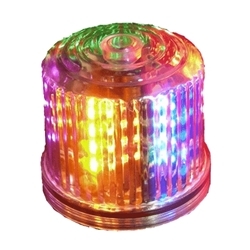 This flashy, multi-colored beacon is a real attention-getter! When mounted on a wall or ceiling, it displays a eye-popping "rayed" effect. Strong magnets on the base make it easy to mount the unit on metal surfaces. Long battery life, 20 hours continuous use with 4 AA batteries(not included, also has a standard jack for an optional 110V power adapter (not included).